World Of Tomorrow - "Global Citizen"
Psychedelic jazz monsters World Of Tomorrow return with their fourth and most overtly Space Rock oriented release to date. The lineup has been stable, still consisting of Scott Prato on bass, vocals and electronics, Chris Morrow on trombone, vocals and electronics, Tim Byrnes on trumpet, Cliff Ferdon on drums and trumpet, and Bonnie Kane on saxophone, flute and electronics. Ok, honestly, in some respects this album could have been sub-titled: Space Ritual Revisited. Sure the cosmic jazz that are a trademark of the WOT sound is present. The opening track, "Neptune's Watery Hammer", makes clear that Global Citizen will feature more of the excellent cosmic jazz heard on last year's "III" CD. It's a combination of free-jazz and garage rock with wailing horns, but also thudding raw rock bass and thrashing drums. "Jungles Of Central Jupiter" is the longest track of the set and begins with trippy jazz jamming flute and horns. But soon tension starts to build as we hear Arkestra horns on the one hand and Bonnie Kane's rousing W.O.O. Revelator styled sax cranking up the adrenalin until the full band explodes in a rocking jam that blurs the lines between free-jazz and power rock, partly due to the Prato/Ferdon rhythm section who sound like they were pulled out of Cream or the Hendrix Experience. "Inversion" is an interesting marriage of space and jazz on which we hear Angels and Demons at Play styled Sun Ra embellished by freaky but reserved space electronics. The song also demonstrates what a solid and melodic horn section the WOT players are. And "Pigeons Slowed Down" is another psychedelic jazz jam with a hint of Sun Ra and some killer flute leads. But there's another completely unfiltered Space Rock element to Global Citizen. "Descent Into Ohio" and "600 Year Voyage" are both space electronic freakouts that would be right at home on Hawkwind's Space Ritual. (I'll assume the title of the former refers to the band's journey to the Strange Daze Festival in Cleveland.) I found myself looking hard at the credits to see if Del Dettmar or Dik Mik were listed as guests. And then, still in Space Ritual territory, "The Soft Black Ground" features Scott Prato delivering Calvert styled spoken word backed by bubbling alien space electronics, sparse horn lines and drones, and dark choral chants. "Equal And Opposite" is another powerful droning space rock tune with pounding bass and drums and blazing saxophone leads. And "Looking" is possibly the wildest track on the album marrying total Space Ritual electronics with a completely freaked out cool jazz jam. 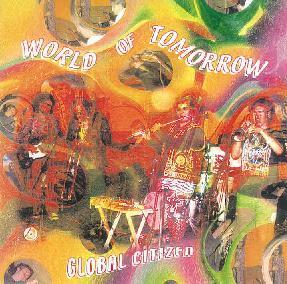 In summary, Global Citizen is World Of Tomorrow's strongest recording to date, showcasing a band that comfortable occupies and bridges the worlds of jazz, psychedelia, and space rock. HIGHEST recommendation to readers who appreciate Aural Innovations' incorporation of jazz into our space rock theme. For more information you can visit the W.O.O. Direct web site at: http://www.wooweb.com. Contact via snail mail at W.O.O Direct; PO 249 Knickerbocker Station; New York City, NY 10002-0249.